Sable is a tan coloring overlaid with varying amounts of black. The entire guard hair may be black, or it may be black only at the tip. 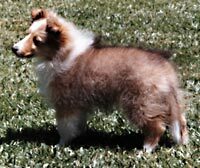 Some sable Shelties have relatively little black overlay. These can appear as gold or red sables, depending on the shade of tan. Mahogany or shaded sables have abundant black in their coats, and are sometimes incorrectly called tri-colors. Sable coloring changes as the dog matures. These two photos of the same dog show how the dark spectacles, or raccoon eyes, disappeared as he grew up. A sable puppy is often born very dark, and lightens as the wooly puppy coat comes in. 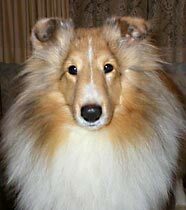 In the adult, the sable color darkens as the dog gets older, with increasing years bringing greater numbers of black or black- tipped hairs into the coat. 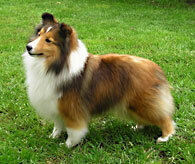 Sable is the dominant gene of the three Sheltie genes at the "a" or Agouti locus, the other two being tricolor and recessive black. 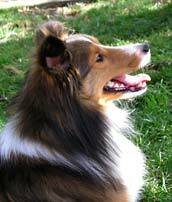 Sable is dominant over tricolor, and both sable and tricolor are dominant over bi-color black. White marking are produced independently of the agouti series genes. The merle pattern can be superimposed on the black hairs of sable, tricolor and bi-black dogs to produce sable merles, blue merles and bi-blues. Homozygous sable merles, like homozygous blue merles, can be expected to have defective hearing, defective vision, or both. See the color inheritance page for more information. 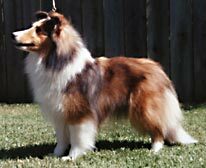 A sable merle occurs when the merle pattern is superimposed on a sable color to dilute some of the black hair to blue. 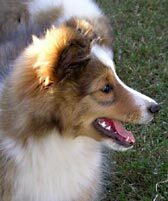 Although the merle pattern is generally obvious in the newborn, it may be less apparent in the adult dog. 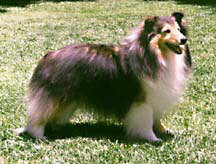 The Sheltie standard does not directly address the sable merle color. 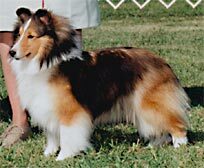 Therefore, the sable merle Sheltie should be judged like any other sable. 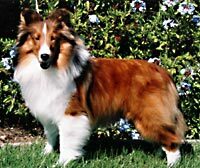 "Washed-out or degenerate colors" are a fault, with "blue or merle eyes permissible in blue merles only"
Breeding Caution: As with blue merles, the breeding of two sable merles, or of a sable merle to a blue merle, can produce homozygous merle puppies that are frequently deaf or blind.